ROME (CNS) — Pope Francis’ decision to hold two synods of bishops on the family with a year of consultation and reflection in between fits in exactly with this theological approach to pastoral planning, which emphasizes studying the reality, reflecting on it and, only later, taking action, said retired German Cardinal Walter Kasper. People who read everything Pope Francis does as fitting in with their idea of the reform of the church and those people who see everything he does as negative are viewpoints that “are in danger of undervaluing or even trivializing Pope Francis,” said the cardinal, who is preparing a book on Pope Francis’ theology. The method “has its own profile in the Argentinian variant of liberation theology,” which is not focused on a Marxist evaluation of the economic and political situation of the poor and oppressed, but is “a theology of the people,” one which takes the experience, wisdom and piety of all Catholics seriously. Pope Francis “does not represent a liberal position, but a radical one,” one going back to the roots of the Christian faith, which is the Gospel “listened to, meditated upon, lived, celebrated and witnessed,” said Cardinal Walter Kasper. “He is not an academic theologian, but a man of encounter and praxis,” the cardinal said. “It is not without interest that he is the first pope who has grown up in a multicultural megapolis in the South,” which makes him accustomed to great ethnic, linguistic, cultural and economic diversity. “He is a deeply spiritual man convinced that our diverse and tension-laden reality can ultimately be fully understood and interpreted only in the light of the Gospel,” he said. For the pope, “faith is a light,” but “not like a lighthouse” fixed on the shore, he said. Rather, it is a torch that “illuminates the way as you go ahead” step by step. Another key focus of Pope Francis’ theological teaching, he said, is joy. “The pope is intent on overcoming the absence of joy and mirth in the church and in the modern world,” denouncing “inertia of the heart, the gravity that drags us down, torpor” — those temptations condemned by St. Thomas Aquinas and the early fathers of the church. His vision of the renewal of the church is motivated by “the joy of the Gospel,” which is the title of his 2013 apostolic exhortation, the cardinal said; a return to the Gospel has motivated all reform movements within the Christian community from the development of monasticism to the reforms of St. Francis of Assis and St. Dominic. 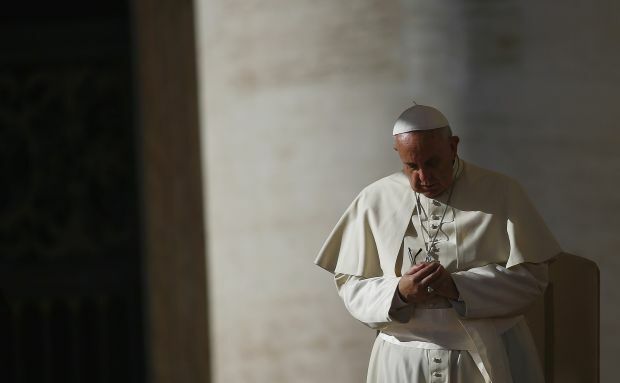 Pope Francis’ repeated preaching about God’s mercy, “the center of the Gospel, the theme of his pontificate,” is not a betrayal of church teaching, but the center of its identity as a sign and sacrament of God’s love in the world. Cardinal Kasper’s theological work on God’s mercy formed the basis of his proposal to the College of Cardinals in February that the church consider ways to admit to Communion Catholics who have been divorced and civilly remarried without having their sacramental marriages annulled or abstaining from sexual relations. The cardinal told his audience Dec. 11 that he was not talking about distributing Communion to everyone without distinction, but he was asking the cardinals — and now the bishops involved in the upcoming Synod of Bishops on the family — to consider how, in some circumstances, divorced and civilly remarried couples could go through some kind of “penitential process” for the failure of their sacramental marriages, leading to absolution and Communion. With his focus on mercy and his insistence that the church and its pastors recognize the reality people are living with, Pope Francis hopes to discover new pastoral ways to reach people and bring them closer to Christ, Cardinal Kasper said. He knows that requires attentive study and listening — which is what pre-synod questionnaires are designed to elicit — as well as prayer and consensus. Pope Francis has said that he wants to hear what the world’s bishops have to say and, the cardinal said, the pope hopes to build a broad consensus about how to proceed. But Pope Francis also knows that he is the pope and ultimately he has the responsibility of adopting or rejecting new pastoral programs.